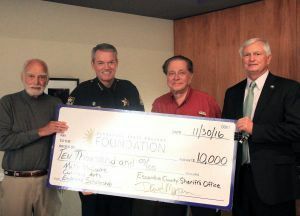 Pensacola State’s Culinary Arts program received a $10,000 boost Wednesday from the Escambia County Sheriff’s Office, Sheriff David Morgan. Morgan made the donation to the Molly McGuire Culinary Arts Endowed Scholarship fund. Molly “McGuire” Martin, the matriarch of McGuire’s Irish Pub in Pensacola, died in August 2014. In June 2015, the over $200,000 scholarship endowment was established at the college with contributions from more than 200 Pensacola area residents and businesses. Interest from the endowment funds annual scholarships for Molly McGuire Culinary Arts Endowed Scholars. Also, the college’s culinary arts dining room was renamed the Molly McGuire Culinary Arts Dining Room. Morgan said the donation is part of the sheriff’s office long-term community reinvestment efforts. In fall 2015, the first scholarships were distributed to several culinary arts students. Pensacola State President Ed Meadows said he and the entire college family were touched by Morgan’s generosity. McGuire Martin said his late wife would be “so, so pleased” with the gift. Jim Reeves, a longtime Martin friend and real estate attorney, spearheaded the initial fundraising efforts for the endowment following Molly “McGuire” Martin’s death in 2014. Morgan said the donation was part of the sheriff’s office diversionary plan which serves as an incentive for young people to continue their education. “This was my first time partnering with Mr. Reeves and Mr. Martin but the sheriff’s department plans to make more donations to Pensacola State’s culinary arts program in the future,” he said.